Nice hat. I got it as a gift for my husband. I measured his head and @ 56 cm he fit into a M according to the size chart. He shaves his head, so there isn't any bulk with hair. The hat just fits. The hat should be made to reflect the measurements of the chart. The hat is GREAT, I wear it ice fishing and it keeps my head very warm. The camo pattern is a little bit different than the pictures but that's to be expected with camo. I would highly recommend this hat to others you will be happy plus the shopping is very easy and pretty quick shipping too. Excellent quality, beautiful hat. I was VERY happy with my purchase. FYI, it is not lined in rabbit fur entirely; only the ear flaps and outside the front forehead. Overall, I love this hat and am happy I bought it for my husband. He works construction, and today it will be 20 degrees below freezing. Overall it is a great hat. Very warm. It "shed" fur a little bit at first but not a big deal. Delivery was fairly quick. If you are on the edge and not sure if you want to buy it, I would definitely recommend it. Nice hat . My son love it ! It is my second order and as a prove I love FHW I ordered today 6 woman's hats as a Christmas gift :-) !! Happy Christmas everyone !! I ordered two of these hats. Great product and worth the purchase. Ordered it for my nephew and son. Easy site to work with. Shipped on no time. Would definitely use the site again and recommend it to others. Excellent quality and true to size fit. 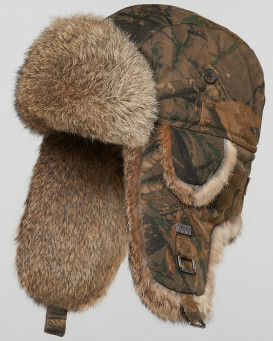 I use it mainly for hunting so believe me it's a very warm hat. I had a very pleasant shopping experience. Easy to navigate and complete transaction. I would recommend this website to anyone. Had this shipped directly to my son. He said the hat fit perfectly(2x) and he loves it. He spends the majority of his work day outdoors and says the hat is very warm. Love the hats I ordered. Very good quality and a perfect fit. Love the hat, Overall good experience dealing with this website, Easy to order fast delivery. Its all good! Superb quality. Snug and toastie warm. Excellent value and speedy delivery. Very pleased. I ordered it as a gift, and they LOVED it. Great quality, would definitely buy here again! Thank you! Very quick delivery, good quality item, very pleased. I've ordered a few of these hats for my sons and they love them. They fit well and the quality is very good. Received within a few days of ordering. Good website, easy to use, quick delivery, the hat is great, really warm, good sizing just need cold weather now!! The trapper fur hat is an attractive, well made hat as described. Received in good condition. Based on 25 customer reviews.